Of the one hundred milkweed species found in North America, common milkweed or Asclepias syriaca is probably the best known. Common milkweed is actually found the world over and when it is not blooming, it goes unnoticed growing in wastelands, along roadsides and in open meadows. Common milkweed is abundant but many people are completely unaware that it has a variety of medicinal benefits and can be used as a natural treatment for a variety of health complaints. These days, milkweed is an undervalued natural remedy but that was not always the case. Historically, it has been used to treat a range of conditions. The Native Americans used juice squeezed from the plant and tea made from the creosote bush to make poultices to draw poisons from the body. Infusions made from the leaves and roots have also traditionally been used to treat coughs, asthma and typhoid. The Native Americans also chewed on the milkweed root to help treat dysentery. If it is not prepared correctly, milkweed can be poisonous and it was the native Americans who taught the European settlers to cook the plant correctly so that it could be safely consumed. Milkweed contains a sticky sap which can be useful medicinally but contains a mild form of poison. Milkweed gets its common name from this milky sap. The same milky sap can be applied topically to get rid of warts. The sap has a bitter taste which helps warn away insects and other creatures that want to feed on its tender leaves. The monarch butterfly’s larvae are immune to this poison. They feed nearly exclusively on the plant’s leaves which allows them to accumulate sufficient levels of this poison in their body to keep predators from eating them. The tough, fibrous stems of the milkweed plant were twisted to make twin or rope and also woven into a coarse fabric. During World War 2, the sap or latex from the plant was considered as a potential replacement for rubber at a time when the Japanese looked like taking control of the world’s rubber supply. Attached to the milkweed seed pods is a fluffy, white material similar to cotton balls. It has been used to stuff quilts, pillows and mattresses and as a kindling to start fire. Milkweed can easily be confused with other similar looking plants like dogbane. It is important to identify the plant correctly as some of these lookalikes including dogbane are poisonous to humans. The milky, white latex substance found in common milkweed has been used as a treatment for warts for many long years. According to traditional use, it makes an excellent remedy when applied to the wart for a few weeks. You should extract the latex substance from the plant and apply it several times each day for 2 or 3 weeks. After doing this, the wart should eventually turn black and drop off. The sap extracted from dandelion stems has a similar effect but milkweed is considered to be the better natural treatment. A number of herbs provide excellent support for the lungs and can help improve respiration and milkweed is no exception. According to traditional use, milkweed can help to relax the bronchioles, reduce spasms and loosen mucus in the respiratory system. You can try using milkweed to treat a range of conditions that affect the lungs and the respiratory system including the common symptoms of the cold. You can also use milkweed to ease your breathing difficulties from more serious complaints such as bronchitis and asthma. Milkweed has diaphoretic properties meaning that it can be used to promote sweating and cool down the body if you are suffering from a fever. The same diaphoretic properties make it an effective herb for various conditions that cause fever but it is also able to stimulate blood flow to the body’s extremities. Milkweed can help improve your digestive health in a number of different ways. It stimulates the production of enzymes and stomach acids that help you digest your food better. It can also be used to treat a number of common digestive complaints like constipation and indigestion. If you have a sensitive digestive system, you should be careful as the effects of milkweed can be quite intense. Consuming too much can cause diarrhea or nausea in some individuals especially if you overdo it. According to herbal experts, common milkweed can also be used to detoxify the body. Over recent times, people have become more aware of the need to detoxify their systems in order to keep the organs in top working order. Milkweed can help you achieve this by helping to clear harmful toxins from your body. Its ability to improve circulation of blood and lymphatic drainage along with its beneficial actions on the kidneys and digestive system makes it a decent choice for anybody trying to cleanse their body. Most of the milkweed plant is edible including its leaves, stems, flowers and the seed pods. You should however be very careful to identify the plant properly as it has several poisonous lookalikes including dogbane. Milkweed has a reputation of being extremely bitter which puts a lot of people off trying it. According to most recommendations, milkweed needs to be boiled several times to make it palatable and remove the bitterness but I have seen several recipes online that suggest this is not true. 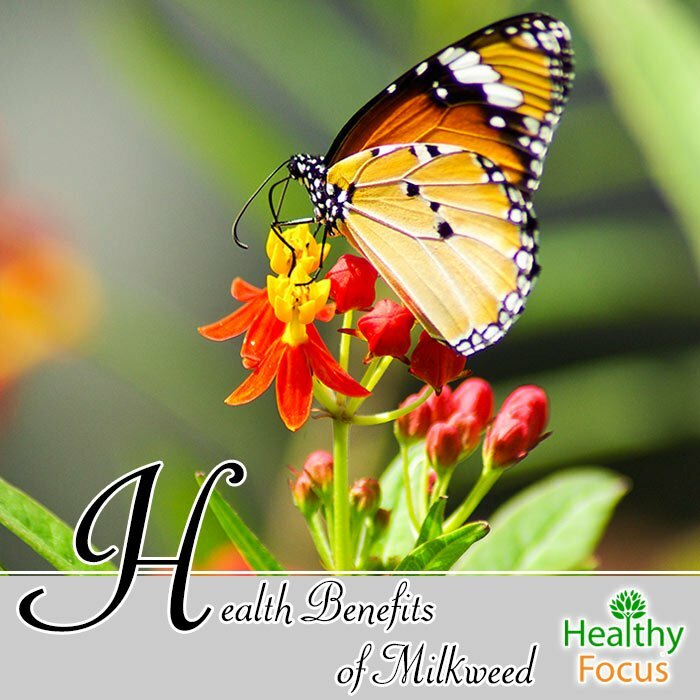 As is the case with any herbal medicine, care should be taken before you start using milkweed. There is precious little scientific research on the herb but the following guidelines are recommended by experts. Milkweed should not be used for long periods of time. You should not use the herb for more than a couple of months at the most. Because of its potency and mild toxicity, it should never be used by pregnant women and nursing moms. Very young children should not use milkweed. It should not be used by people with heart disease or hypertension unless you are supervised by a medical expert. Milkweed may interact with certain medications and should not be used by people taking blood pressure medicine. If you are taking any type of medication, consult your doctor to find out if milkweed can interact with it. READ Is Soy Bad for Men? Have you ever used common milkweed? If so, let us know if you felt any benefits or otherwise. We would be very happy to hear from you.